How close can a planet be to its star and still be habitable? If by ‘habitability’ we mean liquid water on the surface, with whatever consequences that may bring on a particular world, then it’s clear that the answer is partially dependent on clouds. We’ve developed one-dimensional models that can study the effect of clouds in various exoplanet environments, but they’re unable to predict cloud coverage, location or altitude. A new paper now describes a three-dimensional model that can make such calculations about atmospheric circulation, with interesting results. Focusing on planets around M-class dwarf stars, Jun Yang and Dorian Abbot (both of the University of Chicago) and Nicholas Cowan (Northwestern University) are quick to note that red dwarfs like these constitute perhaps 75 percent of all main sequence stars. Current data (based on the work of Courtney Dressing and David Charbonneau) suggest that there is an abundance of Earth-size planets in the habitable zone — one per star — around M-dwarfs. The close orbits and deep transit depth of planets in the habitable zone here make them relatively easy to detect. Yang, Abbot and Cowan put their model to work looking at the effect of water clouds on the inner edge of the habitable zone, with results showing that clouds can have a significant effect on cooling the planet, allowing liquid water to exist much closer to the star than was previously believed. Assuming M-dwarf planets close enough to be in the habitable zone will be tidally locked — with one side always facing the star — the team shows that the side of the planet exposed to the star would develop highly reflective clouds at the ‘sub-stellar’ region directly below the sun’s position in the sky. 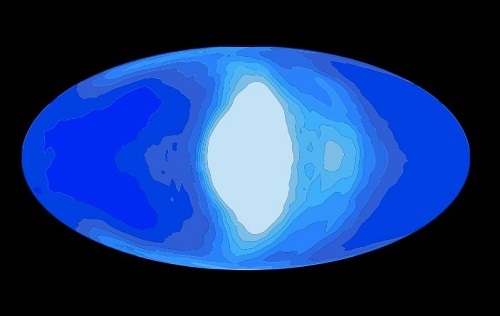 Image: This illustration shows simulated cloud coverage (white) on a tidally locked planet (blue) that would be orbiting a red dwarf star. Credit: Jun Yang. We have performed the ﬁrst 3D global calculations of the eﬀect of water clouds on the inner edge of the HZ and predict that tidally locked Earth-like planets have clement surface conditions at twice the stellar ﬂux calculated by 1D models. This brings already detected planets, such as HD 85512 b and GJ 163 c, into the HZ, and dramatically increases estimates of the frequency of habitable planets. Adopting the planetary demographics from Figure 19 of Dressing & Charbonneau (2013), our revised inner edge of the HZ increases the frequency of habitable Earth-size planets by at least 50–100%. Crucially, we have also shown how this stabilizing cloud feedback can be tested in the near future with thermal phase curves from JWST. The behavior of clouds on planets that are not tidally locked is going to be markedly different. The researchers believe that such worlds will have an albedo (reflectivity) similar to Earth’s because only part of the tropics and the mid-latitudes will be covered with clouds and the water content of the clouds will be small. But tidal lock produces clouds with high water content covering between 60 and 80 percent of the dayside, according to these models. The thickest clouds occur where light from the star is the most intense, thereby significantly increasing the albedo of the planet. Such clouds, under conditions described in the paper, account for 73 K of cooling, thus extending the habitable zone despite the planet’s proximity to the star. What I like about this work is the possibility of testing it in the near-term using the James Webb Space Telescope, with which we can measure the temperature of M-dwarf planets at different points in their orbit. A planet without cloud cover will show its highest temperatures when the dayside is facing the telescope (with the planet on the far side of the star). Temperatures would be lowest when the planet comes around in its orbit to show its dark side to the telescope. This University of Chicago news release points out that we can see the same effect on Earth when looking at places like Brazil or Indonesia from space. An infrared instrument will find unusually cold conditions when it observes the cloud deck, which is at high altitude. Temperature variations of this kind from an exoplanet around an M-dwarf would indicate clouds and confirm the presence of liquid water on the surface. Thus three-dimensional simulations of the way air and moisture move through the atmosphere extend the potential habitable zone in the star’s direction. The paper is Yang, Cowan and Abbot, “Stabilizing Cloud Feedback Dramatically Expands the Habitable Zone of Tidally Locked Planets,” Astrophysical Journal Letters, Vol. 771, No. 2, July 10, 2013 (abstract / preprint). What would such cloud cover do to surface visible light? Would a tidally-locked planet with such cloud cover be too dark for photosynthesis as we know it? A tidally-locked world already has sunlight limited to at best half its surface — it would be ironic if clouds cool such a planet sufficiently to support liquid water, but then make it too dark for photosynthesis to evolve. Thanks for following up on my request(see my comment on the …….”philosophy”….. blog,a few days ago)! Just to re-iterate a few key points in THAT comment: ONE; not only would HD85512b and GL163c be potentially habitable, but GL581C(THAT’S RIGHT:The FIRST planet with ANY KIND of “habitability” claim) would as well, IF(AND ONLY IF) its orbit is CIRCULAR(as Voight, et al claim)ie NOT eccentric, as the swiss team claims. ALSO: GL667C could have FIVE planets in the habitable zone,instead of just 3(h COULD be the first 1 earth mass habitable planet,if it is confirmed, And; d could also be habitable based on the Kopparappu model. That’s a great article Paul, a good catch. If there’s little cloud cover on the perpetual night side of these tidally locked worlds then there would likely be a steep temperature and pressure gradient between the day and night hemispheres resulting in very high wind speeds. Would those winds (if they exist at low altitudes) be powerful and destructive enough to prevent the evolution of complex life? More data needed. There could be differences because of the different spectral composition of M dwarf rays. The significant portion of flux could fall into mid-IR H2O absorption bands, which means the heat would be absorbed not by the surface, but by the atmosphere, heat it well and disperse the clouds, thus no cloud cover, but hot and humid air all the way up to the stratosphere, with clear skies and bloated red sun in zenith. Also, the completely cloud-covered waterworld near F-star, with no axial tilt and 8 hour rotation period would have nice conditions on the poles (although resembling Star Wars’ Camino) even with the Mercury-like insolation because of greatly inhibited (by the Coriolis force) heat transfer from equator to the poles… Yes, there would be more than 100-degrees hot rains on the equator, but it’s still not inhabitable! In some ways this has been covered before, by Merlis and Schneider. Here is a precipitation animation of Earth if it was tidally locked with the sun over the Galapagos. Cloud thickness would be proportional to precipitation. Aren’t M stars prone to intensive flaring events? If so have the models taken them into account? I wonder how the high winds that we suppose would be extant on tidally locked planets would affect the cloud cover. It’s admittedly beyond the model, which is at the very early stages if I understand the paper correctly. One supposes layering of wind effects, even counter-rotating at different levels. Permanent oceans, too, would play a part; indeed perhaps an ocean on the far side is frozen. The paper doesn’t mention how the cloud cover would form but I imagine that the mixing of layers as they swoosh about the planet would form some type of upwelling. A permanent hurricane of sorts? These reports are making science fiction writers of us all, Paul! The most exciting thing about this hypothesis is the very near-term testability of it using the JWST. Are technological reach into the universe is truly amazing… and we are only at the beginning. Very exciting stuff. The most exciting thing about this hypothesis is the very near-term testability of it using the JWST. Our technological reach into the universe is truly amazing… and we are only at the beginning. Very exciting stuff. Thanks for the good synopsis, Paul. There are a number of great questions, a few of which i can answer off the top of my head. Tulse: The cloudy dayside on these tidally locked planets isn’t too different from equatorial regions of Earth. Although these regions are nearly perpetually shrouded in clouds, plenty of sunlight makes it down to the tropical rain forests below. These models are receiving much more stellar flux than Earth receives from the Sun, so even if the planet reflects half that, there is plenty left for photosynthesis, provided that organisms can deal with the red stellar spectrum (that’s for the biologists to figure out). Mike: There are strong winds in these models, but they are high in the atmosphere, just like the jet streams on Earth. The average near-surface winds are about 1 m/s, or about 1 on the Beaufort scale, so nothing to worry about. torque_xtr: The red spectrum of the M-Dwarf is accounted for in the model. Some incident starlight is indeed absorbed on the way down into the atmosphere. The cloud thermostat is actually stronger on K-Dwarfs, which have a slightly bluer spectrum. You’re quite right that rapid rotation tends to weaken meridional heat transport, all else being equal. But if a planet develops a very steep temperature gradient it will usually find a way to move heat around. In any case, the hot equator on such a planet would likely exceed the moist greenhouse limit and would therefore lose its oceans in short order. Ray Pierrehumbert pointed out decades ago that Earth’s tropics would be in this boat if they were unable to export heat to higher latitudes! Michael Spencer: The winds, clouds and ocean circulation are self-consistently accounted for in these global climate models. That’s why it takes so long to run the models, even with powerful computers. These are the very same models that are used to study Earth climate, so although they are not perfect, are certainly cutting-edge. Un saluto, a voi tutti. Ho pensato, leggendo questo interessante articolo, di portare alla vostra conoscenza, un interessante articolo letto di recente, che può dare un contributo alla discussione. I thought, reading this interesting article, to bring to your knowledge, an interesting article recently read, which can make a contribution to the discussion. Yes, the inner edge of Earthlike worlds is limited mostly by water loss from the saturated stratosphere, and this happens with only slightly higher insolation than we have, but with only slightly higher escape velocity and/or lower UV/X-ray flux the loss is greatly reduced, Kepler-11f being the proof. It’s escape velocity isn’t much higher than that of the Earth, and in addition, it is much more strongly irradiated, but obviously is a mini-neptune – if H2 doesn’t leak from it’s atmosphere, it would not leave the stratosphere of heavy oceanworlds with moist-greenhouse, and recombine with oxygen, thus reversing the photodissociation. Also, there is the example of Upsilon Andromedae b, which has cool nightside despite being a hot jupiter with quite slow rotation. This led me to the thought that heat transfer isn’t always very effective, and the worlds with fast rotation and no axial tilt could possibly retain temperate (or at least extremophile-suitable) conditions at the poles at much closer distances than the Earth’s analog HZ inner edge. Very possibly that would not work at the insolation levels of GJ 1214 b, but at the Mercury-like levels, although with superheated equator and perpetual steam-storms, why not? PS the heavy and dry terrestrial world with axial tilt close to zero could be habitable very close to it’s star too, if all the water is confined to the polar seas like methane on Titan – maybe this is the fate of Earth some 3 billion years from now, if the relief allows? Nick, thanks very much for generously coming here to answer our questions. It’s greatly appreciated. There seems to be mass confusion as to what inhibits higher life developing from simple. First and foremost higher life needs conditions to be difficult enough for their complex solutions to living to give a competitive advantage over simple ones. High wind strengths should provide a boon to higher life provided that their maximum wind speed does not vary on timescales that are much much greater than new genes are selected for. Still warm conditions with perpetual light and every vital mineral on hand locally should have the same effect it does on Earth – much more biomass but all higher forms will disappear under layers of slime, mould and disease. Antonio, thanks for sharing that link. Very interesting… and sobering. The thought of red dwarf magnetic fields throttling the life out of planetary atmospheres is a serious consideration. Antonio: Thanks for bringing this paper by Vidotto et al. to my attention! Their hypothesis should be readily testable with the JWST: tidally-locked planets with no atmospheres will have hot daysides and cold nightsides, and therefore will exhibit huge-amplitude thermal phase variations peaking precisely at superior conjunction (full phase). To flip their argument on its head, we may learn something about magnetic field production by figuring out which short-period terrestrial planets have retained an atmosphere. That would be a coup, since magnetic dynamos are poorly understood. Plate techtonics is not an everlasting mechanism. that planets with Less than 2RE masses are geologically dead. A planet cannot sustain life very long w/o recycling of elements. say 30-40 million years for the equivalent of Permian-Triassic die off for complex life to redevelop variety. If a major flaring event Occurs every 10 million years it’s likely a dead world except for hardy rock dwellers. And another point this all conjecture from a model of how red dwarfs work. any magnetic field will be extremely weak to mount much of a defense. activity. The data cannot tells us for the sample time is too short. Tulse, I’m not really sure how grass and cows are competing here (if I really rack my brain, it comes up with them both needing large quantities of water, but could cows really drink a river dry that was supplying a meadow). Cows do eat grass, but the result of that is the very opposite of competition here. Cows destroy other plants (ones that really do compete with grass) that would otherwise grow through the grass then shade them. Also, mobility for plants has a very different meaning than it does for animals. Here their need is for root growth to move towards nutrient patches and water (their potential wrt finding water may well exceed that of cows, thus their mobility, in this respect higher). Plants also need mobility for seed dispersal, and though some do have elaborate mechanisms for this, most find it easier to utilise animals, that is why fruit has actually evolved to be eaten. I don’t know the details of the second need for mobility here for grass, but the easy with which it seems to reach remote islands is a hint that, once more grass has the higher mobility. Finally, I hope you notice from the above, that it is not obvious that graminoids is a less complex group than ungulates. Where would the elements go? They can be indefinitely recycled within the biosphere, with or without plate tectonics. Plenty, if the planet is just a little bit bigger with higher escape velocity. For any conditions, no matter how adverse, a simple, moderate increase in size will have a planet keep its atmosphere and water. Rob, the point of my example wasn’t the specifics of the species chosen, but rather the general point that even in benign environments with lots of resources, it may still be beneficial to evolve complexity. Organisms concentrate elements from the environment, and it will almost assuredly be the case in most biospheres that grabbing those concentrated elements from other organisms rather than extracting them from the environment will be advantageous. Just look at the extant examples we have — environments with relatively few resources (deserts, deep rock, ocean floor) generally have impoverished selections of species, whereas those with abundant resources (jungles, tropical oceans) have a multiplicity of organisms exploiting both those resources and the organisms that use them. But honestly, it’s all conjecture, as we have only one extant example of an environment where life has evolved. Tulse, I heartily agree with the sentiment inherent in your “it’s all conjecture” comment (though that “all“ part goes too far),. However, the balance of evidence that I see points differently to the direction you chose. That tropical rain forest v desert you mention is an interesting one. In a desert active soil bacteria are hard to find, and what, you can find tends to be complex, such as cacti or camel. I have always wondered what the ratio of prokaryote/eukaryotes biomass for each environment, but, from what little I know, the desert should win handsomely. Someone should do a study on that some time, particularly in light of metazoan life on Earth only appearing after the “snowball Earth” episodes. Although tidally-locked habitable planets orbiting nearby M-dwarf stars are among the best astronomical targets to search for extrasolar life, they may also be deficient in volatiles and water. Climate models for this class of planets show atmospheric transport of water from the dayside to the nightside, where it is precipitated as snow and trapped as ice. Since ice only slowly flows back to the dayside upon accumulation, the resulting hydrological cycle can trap a large amount of water in the form of nightside ice. Using ice sheet dynamical and thermodynamical constraints, I illustrate how planets with less than about a quarter the Earth’s oceans could trap most of their surface water on the nightside. This would leave their dayside, where habitable conditions are met, potentially dry. The amount and distribution of residual liquid water on the dayside depend on a variety of geophysical factors, including the efficiency of rock weathering at regulating atmospheric CO2 as dayside ocean basins dry-up. Water-trapped worlds with dry daysides may offer similar advantages as land planets for habitability, by contrast with worlds where more abundant water freely flows around the globe.